As previously reported by The Gateway Pundit, Deep State operative Brennan Gilmore is using our news site, in addition to suing a number of other conservative outlets for correctly reporting on his ties to Soros, the State Department, and his far-left activism. Has admitted to CNN that all our reporting was factual, and admitted it again in a Politico article. The purpose of his impending lawsuit is sole to disrupt conservative media’s ability to report the truth. Well enough is enough, these baseless attacks cannot go unanswered. 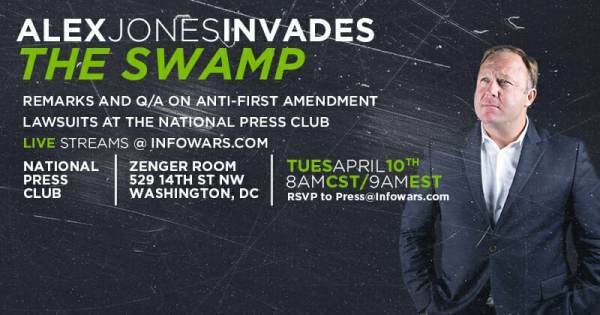 Alex Jones and other noted media icons will speak at the National Press Club in Washington, DC, on April 10 starting at 9AM EST to discuss the recent deluge of anti-free speech lawsuits and the ongoing censorship of independent press. Facebook’s self-admitted censorship of the pro-Trump duo Diamond & Silkis the latest example of discrimination, especially as Facebook and other social media sites promote themselves as public forums that weave the fabric of public opinion. Put Alex Jones Nat. Press Club Speech in the email subject line. You will be sent a QR code that will allow you to enter the National Press Club facility. Access to this event is limited – please hurry!